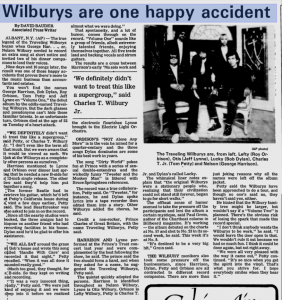 ALBANY, N.Y. (AP) -- The true legend of the Traveling Wilburys began when George Har...,er, Nelson Wilbury needed to record an extra song at short notice and invited two of his dinner companions to lend their voices. Nine days and 10 songs later, the result was one of those happy accidents that proves there's more to the music business than accountants and estates. You won't find the names George Harrison, Bob Dylan, Roy Orbison, Tom Petty and Jeff Lynne on "Volume One," the debut album by the oddly-named Traveling Wilburys. But the dark glasses and pseudonyms can't hide those familiar talents. In an unfortunate turn, Orbison died at the age of 52 on Tuesday of a heart attack. "We definitely didn't want to treat this like a supergroup," said Petty, or Charles T. Wilbury Jr. "I don't even like the term all that much. But we were aware that it would be viewed as such. We look at the Wilburys as a completely other persona as ourselves." Harrison mentioned to Lynne and Orbison over dinner last spring that he needed a new B-side for a 12-inch single release. The other two said they'd help him put together a song. "The former Beatle had to retrieve his guitar, which he'd left at Petty's California house during a visit a few days earlier, Petty said. The lead Heartbreaker was also asked to join in on the record. Since all the nearby studios were booked, the three amigos had to impose on another friend who had recording facilities in his house. Dylan said he'd be glad to offer his assistance. "We all sat around the grass at Bob's house and wrote this song called "Handle With Care" and recorded it that night," Petty recalled. "When it was all done it sounded really good." Much too good, they thought, for a B-side. So they kept on writing and recording. "It was a very innocent thing, really," Petty said. "We were just kind of enjoying it and we were deep into it before we realized almost what we were doing." That spontaneity, and a lot of humor, comes through on the record. "Volume One" sounds like a group of friends, albeit extremely talented friends, enjoying themselves together. All five trade lead and backing vocals and strum guitars. The results are a cross between Harrison's early '70s solo work and the electronic flourishes Lynne brought to the Electric Light Orchestra. Orbison's "Not Alone Any More" is in the vein he mined for a quarter-century and the three songs Dylan dominates are some of his best work in years. The song "Dirty World" pokes fun at Prince with a series of sexual double-entendres and the wickedly funny "Tweeter and the Monkey Man" is littered with Bruce Springsteen references. The record was a true collaboration, Petty said. On "Tweeter," for instance, he any Dylan spoke lyrics into a tape recorder then edited them into a story. Other Wilburys added the chorus, he said. Credit a non-rocker, Prince Charles of Great Britain, with the name Traveling Wilburys, Petty said. Harrison and Lynne performed at the Prince's Trust concert last year and were complimented by the host following the show, he said. The prince said the two should form a band, and when they asked for a name, he suggested the Traveling Wilburys, Petty said. The quintet quickly adopted the persona. 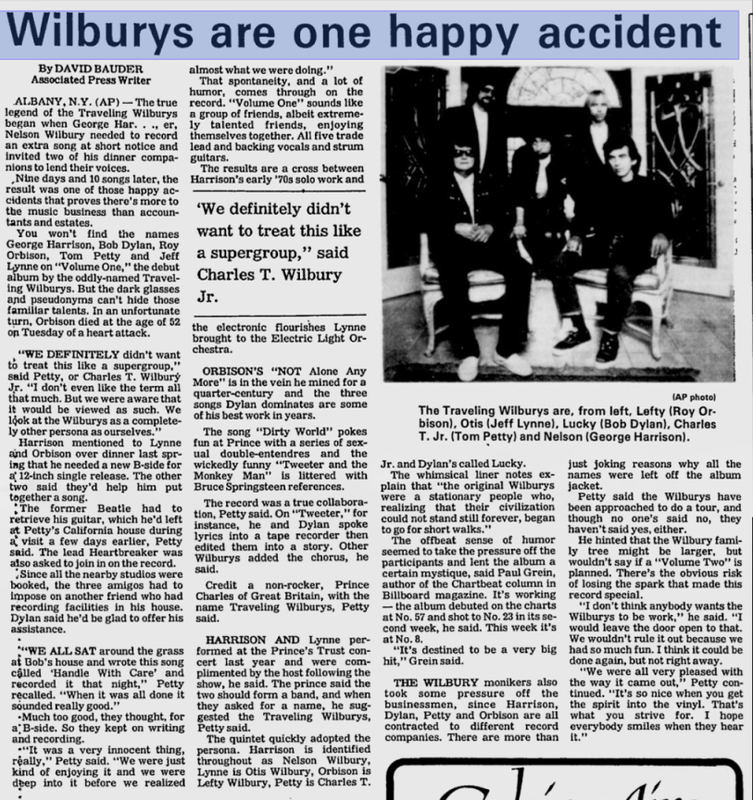 Harrison is identified throughout as Nelson Wilbury, Lynne is Otis Wilbury, Orbison is Lefty Wilbury, Petty is Charles T. Jr and Dylan's called Lucky. The whimsical liner notes explain that "the original Wilburys were a stationary people who, realizing that their civilization could not stand still forever, began to go for short walks." The offbeat sense of humor seemed to take the pressure off the participants and lent the album a certain mystique, said Paul Grein, author of the Chartbeat column in Billboard magazine. It's working--the album debuted on the charts at No. 57 and shot to No. 23 in its second week, he said. This week it's at No. 8. "It's destined to be a very big hit," Grein said. The Wilbury monikers also took some pressure off the businessmen, since Harrison, Dylan, Petty and Orbison are all contracted to different record companies. There are more than just joking reasons why all the names are left off the album jacket. Petty said the Wilburys have been approached to do a tour, and though no one's said no, they haven't said yes, either. He hinted that the Wilbury family tree might be larger, but wouldn't say if a "Volume Two" is planned. There's obvious risk of losing the spark that made this record special. "I don't think anybody wants the Wilburys to be work," he said. "I would leave the door open to that. We wouldn't rule it out because we had so much fun. I think it could be done again, but not right away." "We were all very pleased with the way it came out," Petty continued. "It's so nice when you get the spirit into the vinyl. That's what you strive for. I hope everybody smiles when they hear it."